We met up with another friend at the restuarant and started out our meals with the hummus appetizer. It was pretty good - but I feel like it's hard for hummus to be bad. I'd never thought to pair hummus with squash, a much healthier alternative to pita chips. I also had some delicious tomato and artichoke soup as a starter. So delicious, in fact, that I forgot to take a photo of it. (d'oh!) 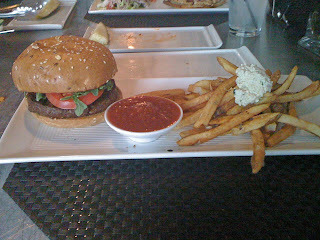 For my main meal, I had a burger with tomatoes, lettuce, and pesto aioli with a side of Chrissie's famous fries. Maybe if I were a meat eater, I might have liked the burger a bit more, but it looked and smelled a little too much like the real thing for me. The fries are always delicious because of the great seasoning - a mixture of rosemary and other spices. Despite vowing to myself to never order vegan dessert ever again because they're usually so disappointing, I ordered a mousse bar. It wasn't bad, but it definitely tasted vegan. I'm sure it's possible for vegan desserts to taste as rich as their non-vegan counterparts, but I've yet to find one that even comes close. 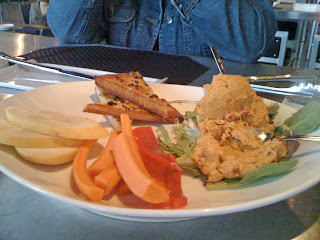 (although I had a fantastic peanut butter vegan bar from Whole Foods the other day...) I wonder if your palette changes once you adopt a vegan lifestyle...hmmm..
After lunch, we went to the Akron Art Museum to see the William Wegman exhibit. I don't even like dogs, but I'm amazed by what Wegman's dog - Fay - was able to do. She was able to sit still in some incredible poses. Until I saw the exhibit, I didn't realize that Wegman had also created some short films of his dogs. Really cute films. My friends and I sat down and watched a video about the alphabet because it was ridiculously cute. One of my friends even purchased it as a birthday present for my Bastille Day birthday friend because it was that entertaining. I'd never been to the Akron Art Museum and was sort of surprised at how small (but mighty) it is. I hope that the Wegman exhibit allows them good exposure and revenue so that they can hold other large scale exhibits in the future. Seriously, the pumpkin and butternut squash risotto they have in the fall is one of the best things I've ever eaten. I can't remember what it was called hopefully they do it again this year!